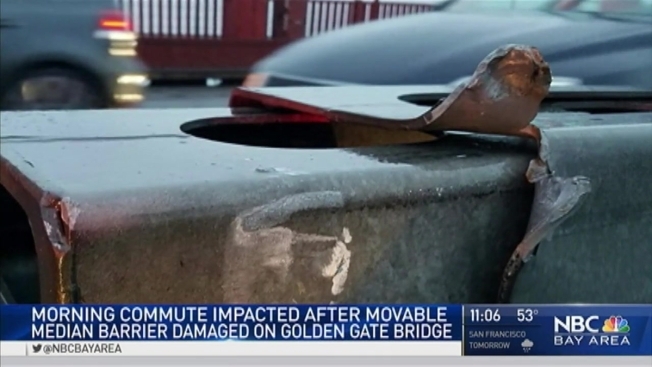 The fourth lane of the Golden Gate Bridge was closed Tuesday morning for emergency repairs on a section of the moveable median barrier, damaged by a passing vehicle, a district official said. Spokesman Priya Clemens said the repairs were made about 10:30 a.m. Two lanes were closed for about an hour on either side of the barrier during the repair. "Crews are going to come out to essentially pull the pins on either side of that unit," she said. "They’re popping out that one section and replacing it with a fresh one and traffic will be back to usual." But the problem was noticed on Monday about 1:30 p.m. during a lane configuration change. The cause of the damage was most likely a passing vehicle, Clemens said. She added that this issue hasn’t occurred before as the barrier is just two months old.